Playgrounds are found in many parks throughout New Jersey, and during the summer are visited by a large number of children. While playgrounds are supposed to give children a safe area in which to play, this is not always the case. Some playgrounds contain hidden dangers that are not immediately noticeable to parents but can result in serious injuries. If your child was injured or killed while playing on a playground, you should not hesitate to speak with an experienced attorney who will remain committed to fighting for the compensation that you deserve. Becoming caught. Parents should remain aware of children who become trapped in small openings on playgrounds. Do not let children play on any rides that have equipment that contains these holes. Falls. It is critical that playground equipment contains adequate guardrails that can prevent children from falling. These barriers should be at least two to four feet high. Trampolines. Sometimes used in playground areas, trampolines are dangerous and should only be used under professional supervision. The Consumer Product Safety Commission reports that 110,000 individuals are injured each year on trampolines. This same advice applies to parents who place trampolines in the backyard or anywhere else around the house. Trip hazards. Playgrounds should be kept free of hazards on which a child could trip. Frequently, these obstacles appear when playgrounds are not cleaned routinely. If there are any conditions that could cause children to trip, be sure to report them to the playground’s supervisor. Unsafe material. Material that is used on the floor of playgrounds should be mats, rubber, or wood. The material should also be several inches thick to provide an adequate amount of padding. Many accidents occur involving children who fall on concrete or hard surfaces. 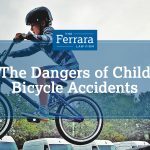 If your child has been harmed by a playground accident, there are likely available options to pursue compensation from the responsible parties. 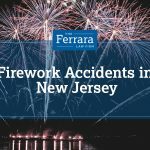 Contact Ferrara Law today to schedule an initial free case evaluation. Our law firm will strive to help you obtain the best possible results and will remain committed to fighting for your rights.